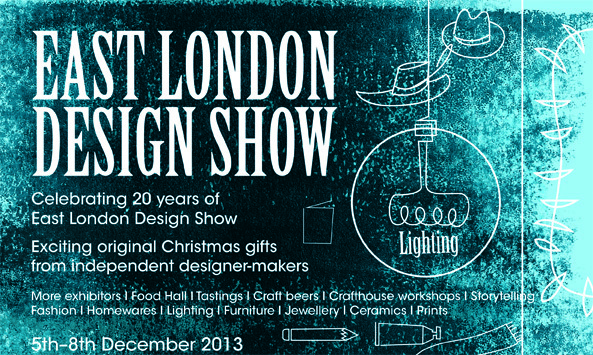 We are pleased to announce we are exhibiting at the East London Design Show between the 5th–8th of December 2013, at the Old Truman Brewery, Brick Lane. As one of the first consumer design shows in London it has earned its reputation as the definitive and hassle free Christmas shopping event, in one location and all from independent designers. To celebrate its twenty years of showcasing Britain’s most promising graphic art, fashion, accessories, product, homeware and furniture designers – East London Design Show is relocating to a bigger venue at the Old Truman Brewery,Brick Lane, walking distance from Liverpool Street Station. Two for one entry vouchers can be downloaded here. Accompanied children under 15: free. This entry was posted in Exhibition, Uncategorized. Bookmark the permalink.